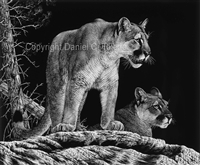 Daniel C. Toledo began his professional wildlife art career as a scratchboard artist in 1971. Creating over 300 originals in this medium Daniel's unique style captures the animal's strength and beauty up close for you to enjoy. Daniel signs and numbers each print and a certificate of authenticity accompanies the print making it a highly collectible piece of art. Scratchboard, also known as scraperboard, is a black surfaced board with a white, slate-like material underneath. A tool (spade) is used to achieve an etched-like effect. Some of the artist's strokes are so fine that they cannot be seen by the naked eye. Using the finest scratchboard available from Sheffield, England, Daniel C. Toledo (D.C. Toledo) introduced scratchboard works of art into the wildlife art field and published his first print in 1972. Toledo Wildlife Works of Art Scratchboard Prints by Daniel C. Toledo are unique. The printing process is called straight-line printing. There are no dots per square inch, or d.p.i., and the finest paper and ink are used to make the end result a near exacting print of the original. These prints shown here represent less that 10% of the works completed by Daniel.